The leaked development version of Windows Blue, an upcoming version of Windows 8 expected later this year, has shed light on even more improvements coming to the operating system. Windows Blue—whose leak prompted Microsoft to admit its existence—won’t be a whole new OS, but rather an update or service pack to Windows 8, packed with incremental updates and features while maintaining the same overall user experience. Our first look at the Windows Blue leak revealed some useful changes. The leaked build includes the ability to snap two apps on the screen in 50/50 ratio (compared to the only 75/25 ratio currently available), additional Live Tile sizing options, easier screenshot sharing, new gesture controls, and better access to critical system settings from the modern-style interface. Paul Thurrott of the Windows Supersite dug a bit deeper and unearthed a feature that will make your life easier if you use multiple Windows 8 devices: a greatly enhanced Start screen sync. Although the interface for managing the feature is broken in the test version, he was able to sync his start screen by simply signing in to two different Windows Blue-equipped PCs with the same Microsoft account. While Windows 8 allows for the syncing of basic settings and your wallpaper, Thurrott reports that Windows Blue ups the ante by syncing your modern Start screen's color scheme and pinned tiles, including said tiles' colors and layout. Meanwhile, Rafael Rivera from Within Windows discovered that the Start screen is just the tip of the syncing iceberg. While rummaging through the registry, he found that you would also be able to sync installed apps, file history, picture passwords, and—most interestingly—tethering and device associations. The latter suggests that once you associate a Bluetooth device with a PC or tablet while you're logged in to your Microsoft account, you'll then be able to use the keyboard automatically on any Windows Blue device you sign in to. The synced tab option in Windows Blue's IE 11. Windows Blue will also come with Internet Explorer 11, which so far does not look significantly different from the current version. Yet the leaked version shows there will be a new option called Synced Tabs, currently inoperative, which would allow you to access open tabs across devices. 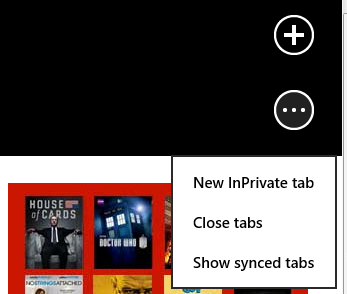 There are already options to sync bookmarks and history with IE 10, and the new feature appears similar to Apple’s implementation across OSX and Safari for iOS, which lets you open a tab on your phone and pick it up on your computer, or vice versa. Rafael Rivera suggests we could see something similar implemented between Windows Blue and Windows Phone devices. Another improvement brings a handy feature in the modern-style version of IE 10 to the desktop version Internet Explorer 11: Swiping horizontally to move through your browsing history. So far it can only be enabled via the Registry Editor, however, and you will then need to restart IE 11 in order to activate the function. If the idea of downloading an illicitly leaked build of Microsoft's upcoming operating system doesn't sit right with you—PCWorld doesn't endorse the idea whatsoever—fear not: You may be able to try these myriad improvements out for yourself before long. Citing anonymous sources, The Verge reports that Microsoft is planning to release a public preview of Windows Blue (though it surely won't be named that) coinciding with the Build 2013 conference, which will be held June 26 through the 28 at the Moscone Center in San Francisco.